Stardom isn’t easy to handle. But when you are a celebrity kid it comes naturally. Whether it is Taimur’s little wave or Stormi’s extravagant lifestyle, our never-ending obsession for these glamorous toddlers is worth a million dollars. Yes, you heard it right! From a small sneak peek in a magazine’s cover shoot to a candid smile at the airport, these celebrity babies are already drowning in millions. Check out some of the most expensive baby photos in the history of the world. Brangelina a.k.a. Brad Pitt and Angelina Jolie have created news with their frequent adoptions. In March 2007, they found Pax in an orphanage and were instantly smitten by his innocent charm. They decided to adopt Pax the same year and made him a part of the Jolie-Pitt Household. Pax’s first photos were sold to People for a handsome amount of $2 Million. J Lo and Mark Anthony’s fraternal twins named Max and Emme created a stir even before they were born. Lopez’s pregnancy was a secret for nearly five months and this helped the twins grow more popular on their birth. Exclusive photos of the twins were sold for $6 Million when they were featured in the People magazine. Unbelievable as it sounds, Brangelina bagged yet another extravagant offer when Angelina announced her pregnancy in 2008. When Jolie gave birth to her twins, the top magazines placed bids to get exclusive pictures of her children. Magazines like People and Hello together paid Brangelina a massive amount of $14 million. The money was eventually donated to the Jolie Pitt Foundation. Matthew McConaughey and partner Camila Alves welcomed their newborn in the year 2008. The little Master Alves then graced the cover of Ok! Magazine that featured his exclusive pictures. They closed the deal at $3 Million for his photoshoot. Brangelina has been drowning in money with their cute celebrity baby photos. Shiloh born in the year 2006 is the first biological child of this power couple. Little did we know that she could make huge sums of money just for entering the world. She appeared in People magazine and her exclusive images were sold for $4.1 Million. Well, that’s not all! The shots of the little princess earned Brangelina $3.5 Million from Hello magazine. Anna Nicole Smith’s ultra-cute daughter became a topic of discussion when nobody knew who her real father was. Everybody believed Howard K. Stern to be her father, however, Stern argued about the timing of Nicole’s pregnancy at the time of their relationship. After going through some DNA tests, it was revealed that fashion and entertainment photographer Larry Birkhead was the real father of Dannielynn. This controversy helped Larry bag a huge sum of $ 2 Million for a single picture with his daughter. Famous pop singer Christina Aguilera gave birth to her son Max in the year 2008. Little did she know that a single glimpse of her child to the public can offer her a million dollars. Christina and Max appeared on the cover of the 2008 issue of People magazine. This made her a hefty amount of $1.5 million with just one photograph of her and Max’s. Jessica Alba’s stunning charm has taken the entertainment industry by storm. But her daughter Honor is pure magic in herself. Jessica gave birth to Honor in the year 2008 and made millions with just one click. Ok! Magazine paid Jessica $1.5 million for a photoshoot for just holding Honor in her arms. Britney Spears has always been a queen of controversy and her sister followed her footsteps. Jamie Lynn Spears gave birth to Maddie in 2008 when she was just 17 years old. Little did she know that this controversy will help her make millions on the go. 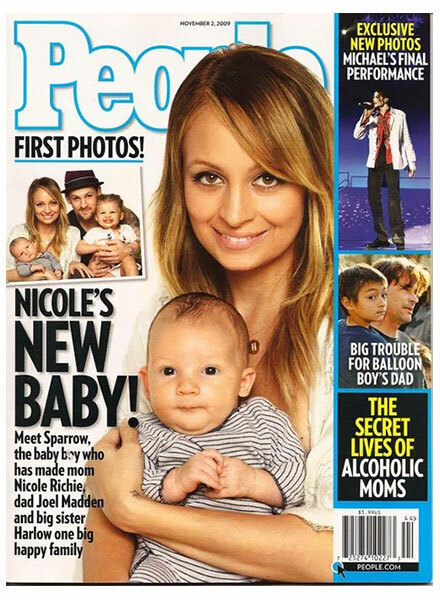 Jamie appeared with her baby Maddie in Ok! Magazine’s 2008 issue where she was paid $1 million for her photoshoot. Lead singer Joel Madden and socialite Nicole Richie welcomed their baby girl Harlow in the year 2008. The world went gaga over her ultra-cute daughter and so were the magazines. The family was featured in the People magazine in the same year and were paid a hefty sum of $1 million for posing.